Depth below parallel on thrusters (ween yourself from the dynamax ball). Fully locked out overhead with portion of ear showing in front of arm (pull head through the window). MY CROSSFIT EXPERIENCE: I have finally found what I have been looking for, structure and direction in my health and fitness !!!!! 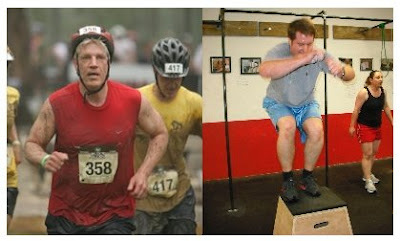 MY CROSSFIT EXPERIENCE: Challenging, motivating, fun and extremely effective. I will never return to a “Globo gym”. The picture of Jim is from his participation in the recent Muddy Buddy team race. This year, Jim and his partner finished 3rd (out of 30 teams) in their age group, and 55th out of 1100 teams overall! This is Jim’s team’s best performance ever. Here’s how the race works: one teammate runs approx. 1.5 miles while other teammate rides mountain bike trail for about 2 miles. The team then completes an obstacle of some sort such as climb a rope wall or walk a balance beam. They then swap what they were doing. One runs and one bikes until they reach the next obstacle. They do this for over 6 mile track and in the end crawl thru a large pool of mud at the end of the race. Extremely fun race and for a great cause. Money goes to the “challenged athletes foundation” (athletes with prosthetics) more information about the charity and the race is located here. M.E. and G-Metcon, Monday May 18th CFHR is ONE Year Old!